Don’t let the whole wheat flour fool you. This sandwich bread is light and fluffy with just a hint of sourdough to give it great bought-at-the-local-bakery flavor. It’s fancy enough for company but still perfect for PB&J during the week. Combine the milk and butter in a microwaveable bowl or glass measuring cup. Microwave on high for 1 - 1 ½ minutes, until the milk is warm to the touch and the butter is very soft. (It’s OK if the butter doesn’t melt completely.) Pour into the bowl of your stand mixer. Add the bread flour, sourdough starter, eggs, yeast, maple syrup, and sea salt to the mixer bowl. Using the beater blade, mix on low for about 30 seconds, until the ingredients are well combined. Then, increase the speed to medium, and mix for an additional 2 minutes, until a smooth batter forms. Add 4 cups of the white whole wheat flour to the bowl. Switch to the dough hook and mix on the lowest (stir) setting on the mixer. A soft dough ball should begin to form after a few minutes. Gradually add just enough remaining flour so that the dough is not sticky to the touch (though, it will still be quite soft). Once the dough is smooth (approximately 3 - 4 minutes), transfer the dough to a lightly greased bowl. Cover with a damp towel and let the dough rise until it has almost doubled in volume and the imprint of two finger remains in the dough. Meanwhile, lightly grease two 9 by 5-inch loaf pans. Preheat the oven to 350F. Punch down the dough and divide it into two equal pieces. Roll each half of the dough out into a rectangle approximately 9 inches wide and 12 inches long. Tightly roll up the dough to form a loaf that is approximately 9 inches wide. Tuck in the ends and place the seam side down in the prepared loaf pan. Cover with a damp towel and let the loaves rest again until the tops are just above the top of the pans and the loaves look slightly puffy. Bake the loaves for 45 minutes. Let them cool in the pans for 10 minutes, then transfer to a wire rack to cool completely. I wish you guys would put in directions for bread machine! This recipe calls for up to 7 cups of flour. If you have a bread machine with that capacity, you can certainly make it in your machine. 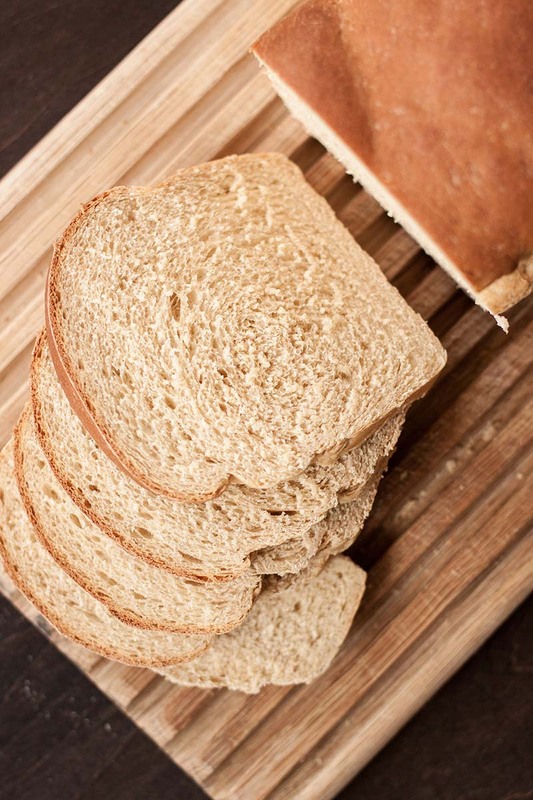 Follow the manufacturer’s recommendation for the order of ingredients, and choose the whole wheat bread cycle. You may be happy to know that we have a bread machine recipe section on our website: https://redstaryeast.com/recipes/bread-machine-recipes/. Seems like a pretty good recipe! I don’t have it out of the oven yet but it’s lookin’ good so far. I used about 3 cups stoneground wheat flour and about 4 cups or so of white bread flour because I ran out of the stoneground. This is the first time I’ve used stoneground wheat in bread. It does seem to take way longer to rise but it smells excellent! Can you use regular sour dough starter with this whole wheat recipe? I’d prefer to not have to continue feeding 2 different types of starters. Yes, you can use regular sourdough starter with this recipe. Thank you for letting us know about the error. We’ve corrected the recipe, the baking time has been added.